← Ever wonder just how a read is a great read? See what I’ve planned for next month. An all new full-length Raveneau Novel. A marriage of convenience in the Gilded Age…. Newport heiress Catherine Beasley Parrish has been groomed all her life to marry an English duke. However, when she meets Adam Raveneau, the latest in a long line of Raveneau rakes and a newly created viscount, Cathy awakens to a destiny worth fighting for. Although Raveneau insists that he is not marriage material, he is in desperate need of funds to restore Tempest Hall, his crumbling family estate on Barbados. And when Cathy begs him to save her from the toad-like duke her mother intends her to marry, Adam realizes that they may be able help each other. Following a passionate honeymoon voyage on the high seas, Cathy and Adam arrive at their island home to find legends of pirate treasure and face the realities of their complicated marriage of convenience. Can two people who wed for all the wrong reasons discover that a lasting love is the greatest treasure of all? My Review: The situation of this quite humorous story tickles my funny-bone. The characters are of various personalities, most deeply flawed adding to the spirit of the story. Enjoy the falsity of the rich in Rhode Island, sail to Barbados, an island you will feel, taste and smell. The contrast is striking. The Parrish’s live in Rhode Island, a very American family, and are tremendously rich, thanks to Mr. Parrish’s cleverness in trade. So, what’s the problem? Catherine’s mother, Hermoine, needs her daughter to marry a titled gentleman, priming her daughter for such a moment since birth. I feel a bit sorry for Catherine Parrish. I suppose more than just a bit. She is such a good-natured young lady and has tried to keep her mother happy through the years. She is a free spirit with kindness and a passion for living. However, Hermoine is prickly, snippy– a character author Wright portrays superbly. Along with narrator Emily Beresford’s pacing and tone in the dialogue, this woman jumps off the page as someone you would never like to cross! We see how this affects her relationship with her daughter and her husband, let alone Adam Raveneau once he meets her. She coerces, prods, etc. a duke who is basically penniless. This duke, among other wealthy and titled guests, is invited to a huge ball thrown by the Parrish’s. No expense is too great. She will get her daughter betrothed. This is the moment Hermoine has been waiting for. Bryon, Adam’s friend, happened to snag an invitation. Bryon dragged him to the ball, a ball where all were in costume, 18th century. Bryon was prettily and appropriately dressed, but Adam, being the renegade, he comes as a pirate. Catherine is transfixed! Byron works behind the scenes to get Adam to do something about his circumstances. He has an old mansion on the island of Barbados which is falling apart and he also is without money. Adam is titled, however, but if you were to ask him, he’d belittle the title and even his character. I LOVED HIM! Adam comes to her rescue, but Cathy is no shrinking violet. She is forced to go against her mother’s wishes by a very bold plan! Adam really can’t say how he decided to be her knight in shining armor. I came to love Cathy’s forthright, positive nature. She is an innocent and strictly schooled about men from her mother. Men are just a means to an end. Cathy shows us how much this affects her actions and reactions. Just one more remark about Emily Beresford. I have listened to her work before. Her dialogue is easy to follow. In this story she has dialogue for a child, barks like a dog, is a harpy of a woman, dons the tone of the titled with their ennui, contrasting with Cathy’s family American dialect, and makes the Barbados island real with the dialect of its people at Tempest. She captures all the author wants and takes you sailing! The book is wonderful. The whole series will capture your heart. If you love this historical time with stories set in new America and its colonialist mother, England, you have found yourself a new author! 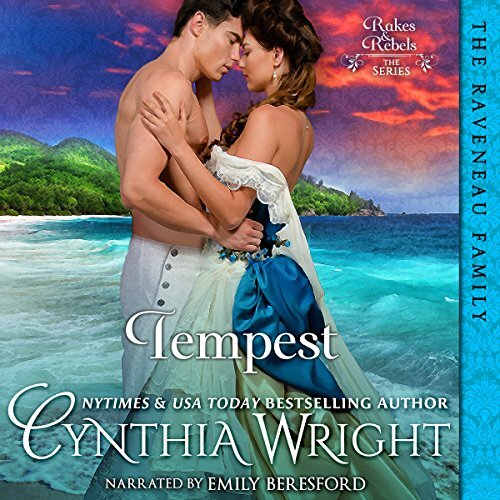 This entry was posted in Action/Adventure, Audiobook, Audiobook Review, Audiobook Reviews, Book Reviews, Historical Romance, Romance and tagged Audiobook Review, Cynthia Wright, Emily Beresford, historical romance, Rakes and Rebels Series. Bookmark the permalink.